Across Canada, people living with diabetes are benefiting from the research of Jonathon Fowles and his kinesiology students. The Diabetes Physical Activity and Exercise Toolkit, which began as a project with his colleague Dr. Chris Shields for the Annapolis Valley Regional Hospital, is helping people to improve their health and fitness and, in some cases, to reduce or even eliminate the need to take insulin. 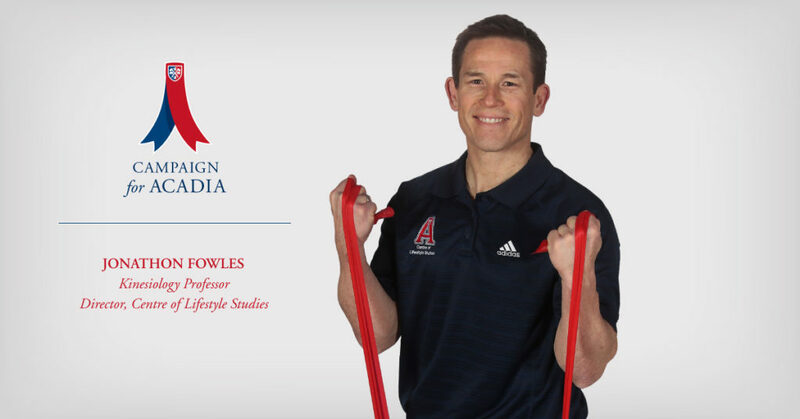 Fowles is director of Acadia’s Centre of Lifestyle Studies, a professor in the School of Kinesiology, and the Clifford Shand Chair in Physical Education. He is also the chair of the National Advisory Council for Exercise is Medicine Canada, and the Scientific Lead for Exercise is Medicine Nova Scotia. When those in charge of the Diabetes Care Program of Nova Scotia looked into the local project, they asked for the same services to be available to the 38 diabetes centres in Nova Scotia. “We developed resources for them and disseminated the toolkit throughout Nova Scotia,” Fowles says. “And then it became standard practice, which was a unique thing at the time in 2008 and became the standard of quality diabetes care when it came to lifestyle education.” From there, the toolkit was disseminated throughout the Atlantic provinces. Then Diabetes Canada wanted it, and it was distributed nationally. Fifteen senior Exercise Training Practicum students each do over 200 hours of practicum work directly with community members across a range of 15 different community programs. These include Acadia Cardiac Rehab, Acadia Active Aging, Acadia–Wolfville Active Kids Exercise (AWAKE), Acadia Performance Training, S.M.I.L.E., and Kinderskills. Participants’ ages range from 2 to 100. In 2017, Fowles was honoured with the Lawson Foundation 60th Anniversary Award of Excellence for his work in Diabetes and Exercise and Exercise is Medicine. He was one of four people nationally to receive this $100,000 award, which he is using to provide education for health care providers and support for physical activity counselling and exercise programs in local communities. He also received the Diabetes Care Program of Nova Scotia Dedicated Leader Award in 2016 and the Canadian Society for Exercise Physiology Professional Standards Program Recognition Award. Fowles also believes that the work he and his students are doing is changing practice and how professionals work, as well as helping to make society better and improve people’s health.